This blog post presents the little toy I made while exploring the HTML5’s canvas and a cube’s visualisation with changing perspectives. You can see the result here: Cube. Let start with the canvas wrapper, the non-cube side of the project. The drawLines functions will be used to print the debug lines and the cube’s lines, with different styles. Also, since we’re displaying a large number of lines, we can do this in one stroke. // Mouse up clears the mouse move handle. For the mousedown we’re using the proxy to compare the mouse’s coordinate with the three handles, and calling generateMouseMoveHandler, which is really a grab that handle function. It’s adding, using the proxy, a mousemove event and setting the new position of the point. Also, when the mouseup event is called, the previously defined mousemove handler is removed. And a few event handlers, nothing too much. I won’t get into the drawing part, it’s only a matter of drawPoint and drawLines, what’s interesting is the logic to attain the cube’s points. Then, we need the first “parallel” lines. 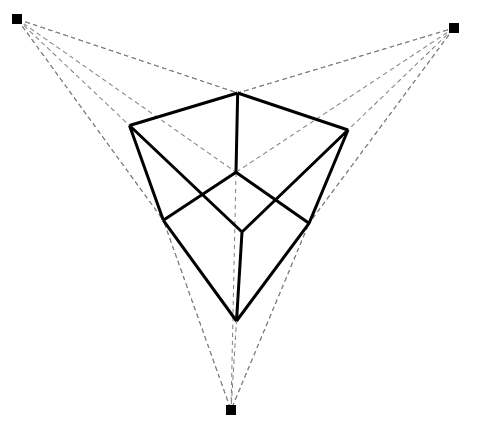 Parallel is quoted here because although a cube has parallel lines, in the 3-vanishing-points-perspective none of those lines are parallels. They are built by joining the middle points with the handles. We get from this all the “front” and “top” vertex. Ultimately where the “top”/”front” is depends on how you view the cube. This doesn’t involve any math, because we’re not creating any new points. This is an adaptation of the formula found here. This function will allows us to find all the “back” points, the center and the three corners, completing the cube. We can now trace all the vertex and our cube is complete. Again to see the result, go here: https://nobe4.fr/cube.